Butler offensive coordinator Matt Mitchell was named the Division III Assistant Coach of the Year by the Miami Valley Football Coaches Association. 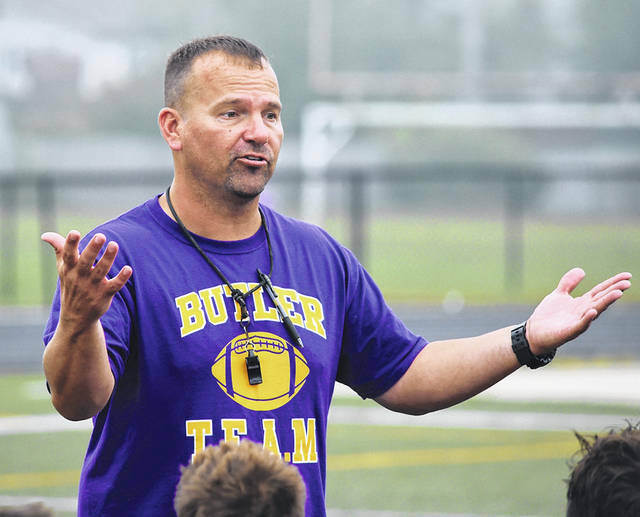 Butler head football coach John Puckett was recently named the Division III Coach of the Year by the Miami Valley Football Coaches Association. VANDALIA — The post-season awards continue to roll in for the Aviator football program. 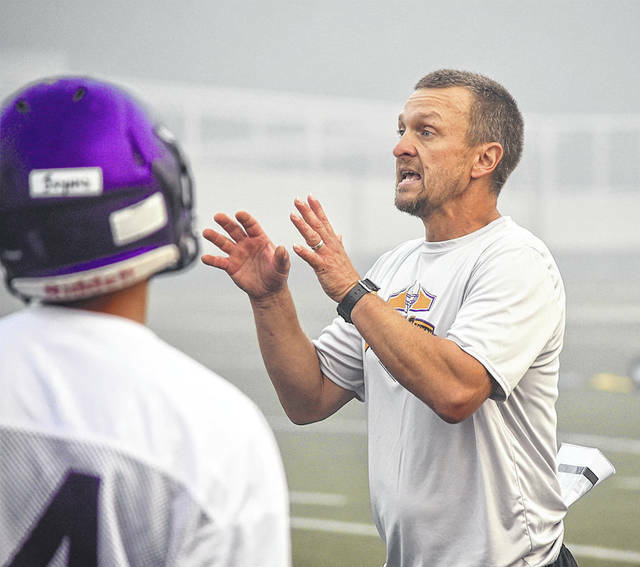 Head football coach John Puckett was recently named the 2018 Division III Coach of the Year by the Miami Valley Football Coaches Association. In his first year as a varsity head coach, Puckett was joined on his staff by his father Jerry which carried extra meaning during the season. Joining Puckett is Offensive Coordinator Matt Mitchell who was named the top assistant coach in Division III. Mitchell, who has coached six years at Butler, has coached under three different head coaches while at Butler. “Anytime you are recognized by your peers that is the ultimate recognition. It’s humbling, very humbling,” said Mitchell. Puckett and his staff are the first coaches in school history to win six games and earn a playoff berth in their first year at the school. Competing in a loaded Greater Western Ohio Conference North Division, the Aviators posted a 3-2 league record while earning just the eighth playoff berth in school history. Last season featured a thrilling overtime win versus Xenia, a nail-biter versus Piqua, and a 33-22 loss to Badin the first round of the playoffs that was much closer than the score might indicate. Mitchell said they key to the Aviator’s success was attitude and effort. Puckett said the support he’s gotten from the community from the beginning has been instrumental to the program’s success. Reach Darrell Wacker at (937) 684-89893 or on Twitter @VandaliaDrummer.